From the old days to the present days, slingshot hunting is still popular and this is an indication that its charm still remains. While it is true that there are various kinds of modern hunting weapons that have emerged in the market, there are still many people out there who prefer hunting using their ever loyal slingshots. Well, this isn’t surprising because a slingshot is handy and portable, easy to use and renders an intense impact that inflicts a tiny form factor. 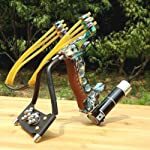 With the popularity of this kind of hunting tool, here we have put together in this review the 3 best hunting slingshots that you may want to get for your next slingshot hunting experience. 2 What is a Slingshot? A slingshot is a small and hand-powered projectile weapon. It is otherwise known as shanghai and British people call it katty or catapult. It comes with a forked Y-shaped frame that has a couple of rubber strips attached to the fork’s uprights. These lead to the pocket that holds the projectile. To fire the slingshot, what you just need to do is to hold the frame using your non-dominant hand, extending the rubber at an arm’s length. Grab the pocket and grip it using your forefinger and thumb of your dominant hand. Pull the pocket near your cheek, aim at your target and you’re ready to fire. Slingshots are commonly homemade especially in the twentieth century era when children made use of these as toys. According to history, slingshots date back during the Neolithic and Upper Paleolithic eras. However, in the eighteenth and nineteenth century periods, the earliest types of slingshots were made in Russia. Russian people call this weapon as “rogatka” from the word “rog” which means horn. The classic form of slingshots way back those times depends on the availability of vulcanized rubber. When people had to make slingshots, they have to get it from a tire’s inner tube. Thus, it is less likely that slingshots were constructed before the year 1888. But from the time slingshots were invented, they had become archetypal toys for the boys until World War II. During those times, slingshots were generally made from a forked tree branch and rubbers derived from the inners tubes of tires. Commercial versions of slingshots soon emerged in 1948 when Wham-O had its first slingshot product. As years passed by, sophisticated and modern models had been made and these included the 1954 Saunders Wrist Rocket, known as the first wrist-based slingshot in history. Since slingshots are very effective and user-friendly for hunting purposes, here we have gathered all the best hunting slingshots in the market today and have come up with three. Take a look at the three slingshots in this review and decide which among them proves to be the best one for you. This kind of slingshot is made and designed with the collaboration of SimpleShot and Mark Seljan, a talented industrial designer. Torque Slingshot represents a culmination of excellent and impeccable industrial design and functionality. It is made from a relatively indestructible material known as polycarbonate which is also made in the USA. In terms of design, Torque Slingshot is considered as a minimalist. However, it is teeming with features that prove to be very useful and essential for every discerning outdoorsman and slingshot enthusiast like you. While this slingshot is compact, it proves to be light you can easily slip in your pocket or your bag without notice. Torque Slingshot also comes with extra wide fork tips that accommodate extra powerful flat bands. It has quick change slots for single or looped strand tubes, providing banding versatility in the process. Its shape is ergonomic and an offset handle natural and intuitive pointing as well as easy slide-shooting. If you are an experienced slingshot user then the Torque Slingshot proves to be the best hunting slingshot for you. Unfortunately, this is not recommended for new shooters and children. It comes fitted with a paracord lanyard and 2040 looped tubes. 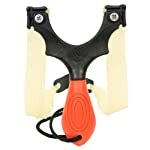 This slingshot comes with high quality, making it as a popular choice among professional slingshot shooters. The material used in its construction is completely solid. 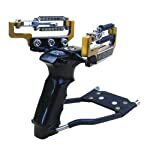 Its frame is made from die-cast aluminum alloy with an anti-skid rope and high-tension rubber bands. From these details alone, you can easily say that Powerful Outdoor Hunting SlingShot is something that you can rely on in terms of durability. The incorporation of high tension and high speed rubber bands is another factor that spells out the excellent power of this slingshot. No wonder, Powerful Outdoor Hunting SlingShot is a popular choice among people who are up to joining outdoor shooting competitions. It is also used for fitness catapults and for boutique collection as well. Worried about the kind of projectile that you will use to shoot your target? Hunting becomes more effective with Powerful Outdoor Hunting Slingshot’s steel balls which are also included in the package. Four rubber bands also come for free so you can have something to use when you need to replace your slingshot’s rubber. With all the great features and characteristics this slingshot exudes, it therefore deserves to be called as one of the best hunting slingshots in the market today. Inspired by the award-winning Axiom design and do-it-all FlippinOut exclusive 3G fork tips, the Scout Hunting Slingshot is something that represents and symbolizes quality, precision and affordability. The entirety of this product is completely designed and made in the United States, specifically in North Carolina. If durability is what you want from a slingshot then The Scout Hunting Slingshot proves to be an excellent choice for you as far as durability is concerned. Its polycarbonate construction renders an extremely strong and highly durable frame that is capable enough to withstand constant heavy use. So, even when you make use of it oftentimes, rest assured that it will stay with you for many, many years to come. The Scout Hunting Slingshot also has the capability to be fitted with anything that’s elastic from TTF to OTT this slingshot provides adaptability and the opportunity to own only one slingshot frame. Thus, this slingshot gives you the chance to experiment on different kinds of elastic materials. It also comes with unattached single layer .030-inch medical latex bands and a pouch made from premium leather, allowing you to shoot whatever you prefer to put on it with minor customizations and do-it-yourself modifications. 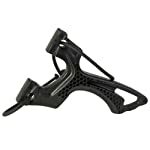 The Scout Hunting Slingshot accommodates different kinds of shooting styles such as hammer grip. Pinched or fork supported. Moreover, its unique asymmetrical palmswell allows both non-experienced and experienced hands to shoot comfortably. If you have small hands, all you need to do is turn the slingshot around backwards, thereby allowing the slingshot’s palmswell to fit ladies’ and kids’ hands. With The Scout Hunting Slingshot, you can shot with the mark facing the shooter and make use of your favorite grip style along the way. How far you have gone searching for the best hunting slingshot? You need not to go any farther. With this review, you are just a few clicks away to find the kind of sling that’s right for you this 2019. Have you tried the Marksman slingshot? It’s simple but I like it better than ones with all the doodads and whatsits.